Предлагаем к чтению аннотацию, описание, краткое содержание или предисловие (зависит от того, что написал сам автор книги «Apocalypse Rising»). Если вы не нашли необходимую информацию о книге — напишите в комментариях, мы постараемся отыскать её. Fifteen years ago, revolution swept across Europe. In Britain, Valeri Kovalenko’s mother and father died taking part, their revolution failing, but their deaths not to be in vain. Now, Valeri and the working men of Britain face a crisis worse than anyone before them, with the rich freely looting and plundering the country’s wealth while the people live under the oppression of unemployment, violence, and death. But not all is lost. In being pushed to the brink of starvation, Valeri finally realizes what must be done. In the working-class parts of London, there’s revolution in the offing again. After living for their whole lives in a world of poverty and despair, men like Valeri have been pushed until they have only one choice: rise! Part future history, part warning on the folly of our times, Apocalypse Rising foretells a spectacular war not on the battlefields of some foreign county but in the streets of our own cities, through crisis, terror, and a cataclysmic devastation the likes of which the world has never seen. Кто написал Apocalypse Rising? Узнайте фамилию, как зовут автора книги и список всех его произведений по сериям. Ниже представлен текст книги, разбитый по страницам. Система автоматического сохранения места последней прочитанной страницы, позволяет с удобством читать онлайн бесплатно книгу «Apocalypse Rising», без необходимости каждый раз заново искать на чём Вы остановились. Не бойтесь закрыть страницу, как только Вы зайдёте на неё снова — увидите то же место, на котором закончили чтение. Fifteen years ago all Europe was aflame. The working man’s passions, so long suppressed, were unleashed in a triumphant surge of insurrection and violence. For three weeks, a few million workers seized the continent and through pure strength of will held the whole world under their sway. It was a time not of heady ideals but intemperate, undisciplined outbursts of the working man made to live a life shackled by poverty, unemployment, and despair. Only a child at the time, Valeri Kovalenko was made to watch as his mother and father were among the striking workers killed in a hail of bullets. On a bright, unseasonably cold winter’s day, Valeri had the chance at a normal life taken from him by the black-clad troops meting out death by the bullet. But events are conspiring, and soon enough he’ll have his chance for revenge. As uprisings go, this one saw much bloodshed, unlike what anyone would’ve expected in the middle of such countries as France, Germany, Spain, and here in Britain. There were strikes and demonstrations, angry voices and raised fists, workers seizing their factories and mills, students their universities, parishioners their churches, the whole lot of them forging a camaraderie from their common stand. But their newfound camaraderie succeeded in changing very little for the working man right away; once the bloodstains was cleaned from the pavement outside Westminster Abbey there was much hatred and recrimination vented but little progress made. Now, there’s war in the offing again, with erratic gunfire rattling into the night and bombs bursting in the streets, here and there the rage of the working man erupting in impassioned acts like the lashing out of cornered prey at the predator. Still the halls of his flat smell of cigarettes. Still he wears shirts and trousers with holes that grow wider by the day. And still he feels tired and sore all over when he returns home in the evening, where he lives under threat of eviction. Valeri Kovalenko knows this is not the life his mother and father died for. In the morning, one morning, Valeri rises, still tired and sore from the last day’s work, the little flat in Dominion Courts he shares with his roommate filled with the summer’s thick, oppressive heat. She’s not there; his only company is the dull roar of the crowds filling the street. In the sweltering heat of an unseasonably warm summer’s morning, Valeri makes for the window and mops sweat from his brow, then turns to the task of facing the day. Fifteen years ago, Valeri was only a child. Now he’s a young man, and his heart rebels against any injustice, however slight, whether perceived or real. As a young man he still holds in his heart bitterness for the murder of his parents at the hands of the troops who’d put down the revolt. Today, he arrives at work to find the machines out of order, with the movement of big, heavy pallets to be done by manual labour. Inwardly he steels himself against the soreness and the tiredness already in his muscles, sure to be magnified a thousand times by the end of the day. At work, Valeri is as a machine, his body moving smoothly, rhythmically, every motion rehearsed ten thousand times until so learned the act of performing his work requires no thought, no input, leaving his mind free to wander. In the city, today, there’s angry voices shouting, heaping insults on the policemen surrounding them, and there’s unemployed youths throwing stones and empty bottles in all directions, with the distant rattling of gunfire seemingly nowhere at all. But on this day when the lights at Valeri’s shop flicker and the ground quivers and the dust shakes free from the bursting of bombs in the streets, Valeri seeks cover not in the imaginary protection offered by the shop’s safe spaces but in the temptation offered by memories lingering in his future. He remembers the way his mother and father would promise to always provide him a place to call home; now a man, he feels forever left to wander the world aimlessly in search of this home so taken from him. It’s in this mindset that he comes to find himself working as a common labourer in a common shop, witnessing, living the exploitation of man by man, not in the wide expanses of the shop’s floor but in his heart. No matter how hard Valeri works, it’s never enough. Targets are met after strenuous weeks, months even, then new, still higher targets set, again met, then set higher again. This is the life of the working man, but one which Valeri’s come to believe with all the passion and intensity of a religious zealot need not have been. Valeri’s immediate challenge, therefore, is to see himself through the day, where once he might’ve had a future now he has only a limitless malaise. But Valeri is a working man, and like all working men he steadies himself against the day about to unfold. He knows of the men in the streets who fight back, with their bare hands if they have to, risking the truncheon and the bullet, but he doesn’t know he’s soon enough to join them. In the common shop where Valeri works there’s always work to be caught up on, missed targets and quotas to be made for, and in this environment men like Valeri can but subsist from day to day. But little has changed since the war fifteen years ago. The wealthy man whose excess caused the rising has only kept on hoarding his wealth, the city sprouting so many glass and steel towers which mark the exact spots where he has seen fit to plant his flag. Each week that passes seems to mark the starting of some new project, the skeletal shells of so many shopping malls, casinos, and luxury residences lined up in a row along the street where once there stood simple, functional apartment blocks. It seems to working men like Valeri vast sums are flooding in and then disappearing quicker than anyone can make sense of, even as his life is marked by the degradation and deprivation of poverty. Now Valeri is part of a larger movement, one about to make good on the promise of the failed rising fifteen years ago, the streets to fill once more with the blood and sweat of men like him. Used to the occasional attacks in the street, the working men of Britain and their bosses don’t foresee the coming apocalypse, but when we all look back on it we’ll see it was inevitable. The boss lady, an Indian woman named Harpal, comes around a few more times that day, each time eyeing Valeri with all the suspicion of a policeman silently interrogating a suspect. It’s not been that long since Valeri was at her mercy, dragged into an office and accused of all sorts of salacious misdeeds, from deliberately slowing production to slandering the name of the shop’s owners. As Harpal comes around for the last time today, inwardly Valeri can only look back and recall each of those accusations as entirely true, salacious or not. You see, Valeri is a dashing figure, prone to outbursts, so confident in the moral superiority of the working class that he brooks no patience for the managerial shenanigans. Only his strong work ethic and his relentless commitment to detail have saved him so far from being fired. Even these habits will soon prove inadequate. He speeds about the floor, dashing madly, hoisting twenty-kilogram boxes onto pallets and shunting pallets into their spaces, the noise of gears whirring and the sound of hydraulics sliding overpowering the senses but never making him feel overwhelmed. Bursting in the distance a wave of sound bounds through the air, seeming to rattle and roll the s hop’s frame gently, in the morning light a thunderous explosion booming across the city, a train derailing somewhere sending scores of men running for their lives with only the clothes on their backs and the air in their lungs. The dashing figure in Valeri imagines himself joining the hopeless fight, making himself one with the ragged, haggard mob, but the better part of him knows he’s destined for something more. Представляем Вашему вниманию похожие книги на «Apocalypse Rising» списком для выбора. Мы отобрали схожую по названию и смыслу литературу в надежде предоставить читателям больше вариантов отыскать новые, интересные, ещё не прочитанные произведения. 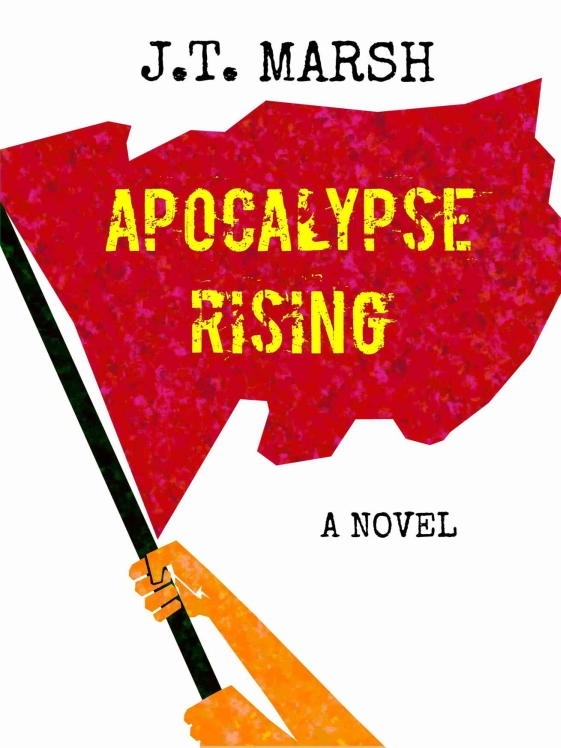 Обсуждение, отзывы о книге «Apocalypse Rising» и просто собственные мнения читателей. Оставьте ваши комментарии, напишите, что Вы думаете о произведении, его смысле или главных героях. Укажите что конкретно понравилось, а что нет, и почему Вы так считаете.